Tropical Storm Nicole was becoming extra-tropical when the NASA-NOAA Suomi NPP satellite passed over it from space and captured a visible picture of the storm. By Oct. 18, Nicole was a post-tropical storm and the National Hurricane Center or NHC issued their final advisory on the system. On Oct. 17 at 12:30 p.m. EDT (16:30 UTC) the Visible Infrared Imaging Radiometer Suite (VIIRS) instrument aboard NASA-NOAA's Suomi NPP satellite provided a visible-light image of the storm. 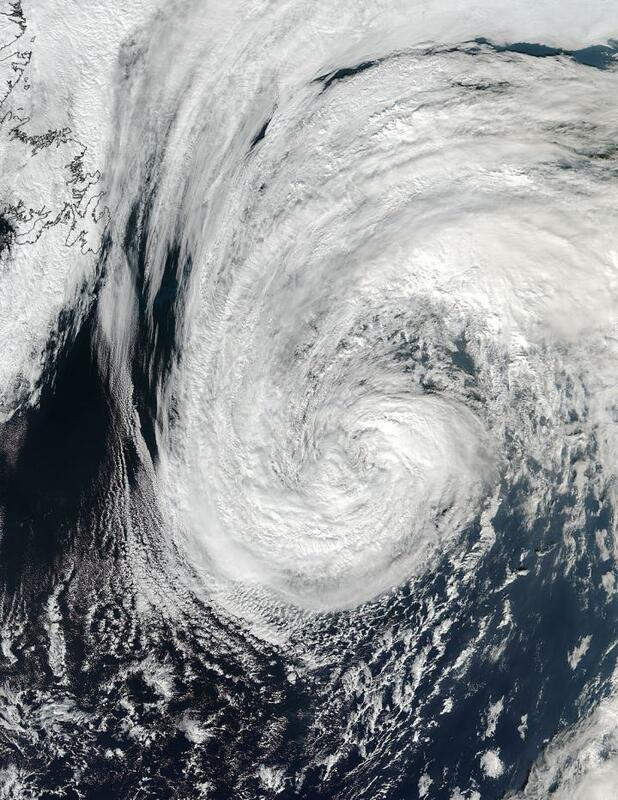 The image showed Nicole had become elongated from southwest to northeast and appeared more oval-shaped with the strongest thunderstorms east of the center. Nicole is finally losing its tropical cyclone characteristics as it merges with a frontal system over the North Atlantic Ocean's chilly waters. Becoming extra-tropical means the storm moves closer to the north or south pole and out of the tropics and its primary energy source changes from the release of latent heat of condensation to baroclinic (the temperature contrast between warm and cold air masses) processes. At 5 a.m. EDT (0900 UTC) on Oct. 18 the center of Post-Tropical Cyclone Nicole was located near 47.1 degrees north latitude and 39.5 degrees west longitude, about 640 miles (1,030 km) east of Cape Race, Newfoundland, Canada. The post-tropical cyclone is moving toward the north-northeast near 31 mph (50 kph) and this motion is expected to continue through Wednesday night. Maximum sustained winds are near 65 mph (100 kph) with higher gusts. The post-tropical cyclone is expected to complete extratropical transition during the day on Oct. 18 and continue as a vigorous extratropical storm through Wednesday night, Oct. 19 or Thursday, Oct. 20 before it is absorbed by another extratropical low. The National Hurricane Center (NHC) noted that Nicole's effects will continue to be felt through rough surf. NHC said "Dangerous surf and rip-tide conditions are occurring in Bermuda, as well as along the east coast of the US from the Carolinas northward into Atlantic Canada. These swells will spread south of the Carolinas to the Bahamas, the Greater Antilles and the Leeward Islands. The coasts of Europe and northwestern Africa will be affected in a few days' time." Nicole is forecast to head north-northeast to the east of Greenland, before being absorbed by another cyclone.